How to set-up your CNAME in UVdesk ? 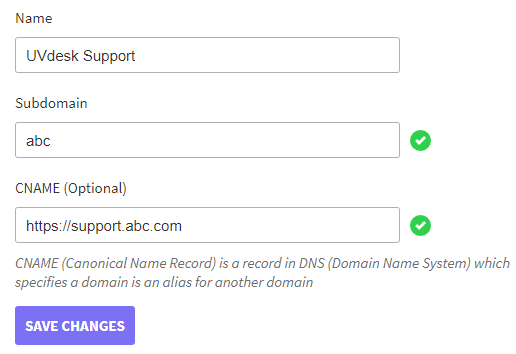 What is a CName (Canonical Name Record)? A Canonical Name record (abbreviated as CNAME record) is a type of resource record in the Domain Name System (DNS) used to specify that a domain name is an alias for another domain, which is the 'canonical' domain ( Source Wikipedia ). In the UVdesk Helpdesk, we provide the owner the ability to add CNAME along with the registered Subdomain so that the owner can access the registered Subdomain through the CNAME also. Let's say you have a UVdesk account where you keep all your reports online, it might be accessed through abc.uvdesk.com and you may also want to access it through support.abc.com. How to set-up your CNAME in UVdesk? On the Dashboard, you will see "SETTINGS" menu and under it, you will find "Branding". Click on the "Branding" Icon and then you will be redirected to a new page. In the new page, you will see a total of five tabs namely- General, Knowledgebase, SEO, Links, Advanced & Broadcast Message. Under "General" tab, the owner can upload Square Logo, Wide Logo, choose Brand Color, enter Name, Subdomain & enter CName (Canonical Name Record). In CNAME, enter another URL through which you want to access your registered Knowledgebase Site and then hit on Saves Changes. After setting up the CNAME please send an email at support@uvdesk.com to inform UVdesk department regarding the same. Then UVdesk support agent will check your set up and provide you the key using which CNAME set will start working perfectly. After putting that key again you have to inform UVdesk for the confirmation and then the agent will verify it from UVdesk end. In the case of any doubt, always email us at support@uvdesk.com and we will surely come up with the best solution possible.